Despite abundant research focused on understanding the importance of mouse renal resident macrophages in homeostatic and disease settings, these findings have unknown relevance to higher-order species, including humans, because markers to identify a similar population of cells across species are lacking. This hinders translating data obtained in animal model systems to human patients. In this study, the authors used a single-cell RNA sequencing approach, followed by validation using flow cytometry, to identify novel markers of mouse resident macrophages and show that these markers also identify a population of macrophages in rat, pig, and human kidney tissue. Over all, their findings serve as an entry point to study candidate kidney resident macrophages across species. Background Resident macrophages regulate homeostatic and disease processes in multiple tissues, including the kidney. Despite having well defined markers to identify these cells in mice, technical limitations have prevented identification of a similar cell type across species. The inability to identify resident macrophage populations across species hinders the translation of data obtained from animal model to human patients. Methods As an entry point to determine novel markers that could identify resident macrophages across species, we performed single-cell RNA sequencing (scRNAseq) analysis of all T and B cell–negative CD45+ innate immune cells in mouse, rat, pig, and human kidney tissue. 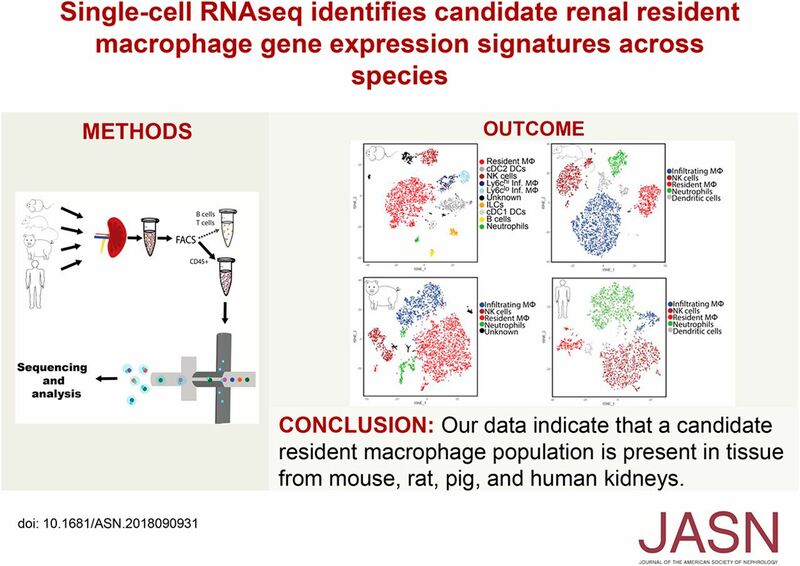 Results We identified genes with enriched expression in mouse renal resident macrophages that were also present in candidate resident macrophage populations across species. Using the scRNAseq data, we defined a novel set of possible cell surface markers (Cd74 and Cd81) for these candidate kidney resident macrophages. We confirmed, using parabiosis and flow cytometry, that these proteins are indeed enriched in mouse resident macrophages. Flow cytometry data also indicated the existence of a defined population of innate immune cells in rat and human kidney tissue that coexpress CD74 and CD81, suggesting the presence of renal resident macrophages in multiple species. Conclusions Based on transcriptional signatures, our data indicate that there is a conserved population of innate immune cells across multiple species that have been defined as resident macrophages in the mouse. Further, we identified potential cell surface markers to allow for future identification and characterization of this candidate resident macrophage population in mouse, rat, and pig translational studies.